Ginger is on a mission to find her family’s missing fortune in glamorous Hollywood in this M!X novel from the author of Lost in London, Lost in Paris, Lost in Rome, and Lost in Ireland (formerly titled Lucky Me). Thirteen-year-old Ginger Carlson feels like she is the only normal one in her family. Her father is an inventor who sells his gadgets online, Mom is obsessed with classic movies, and her brother Grant thinks he is from outer space. 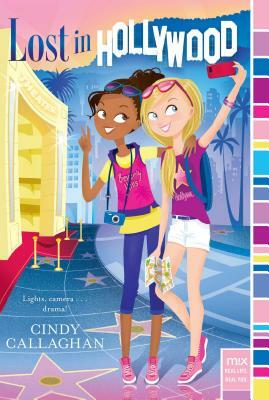 Luckily, Ginger has a totally normal BFF, Payton, and they have big plans for the future—they plan to become doctors and open a practice together in a big city. But first, they’re partnering on the state Science Olympics where they’re sure to take home the gold for their eighth grade class with their model of the brain. In a moment alone with the girls, Aunt Betty tells them what’s really going on. Because she didn’t trust banks, Aunt Betty stashed her money in a secret hiding place. Only problem—it’s so secret, she can’t remember where that hiding place is! That’s what she’s been doing all around town—looking for her fortune. Can Ginger and Payton help find the money—and give Aunt Betty the Hollywood ending that she deserves?